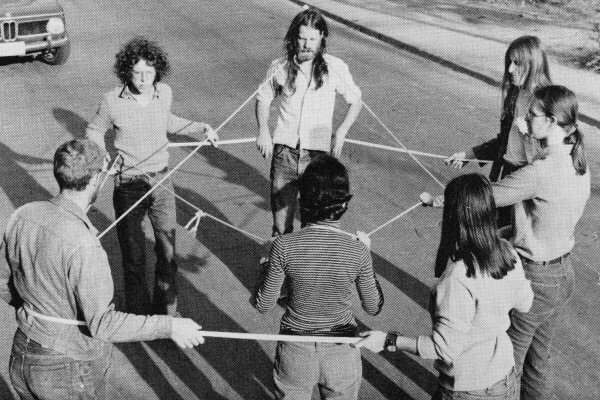 Rehearsal for the video-performance, String Games: Improvisations for Inter-City Video (Montreal–Toronto, 1974). From the exhibition catalogue Lies & Truths – An Exhibition of Mixed Format Installations by Vera Frenkel, Vancouver Art Gallery, May 4 – 28, 1978. Vera Frenkel fonds, Queen's University Archives, Kingston (Ontario). 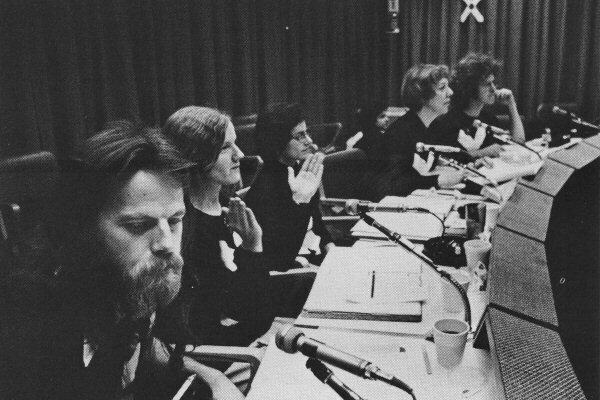 Inside the Bell Canada Teleconferencing Studios in Montreal during the video-performance, String Games: Improvisations for Inter-City Video (Montreal–Toronto, 1974). 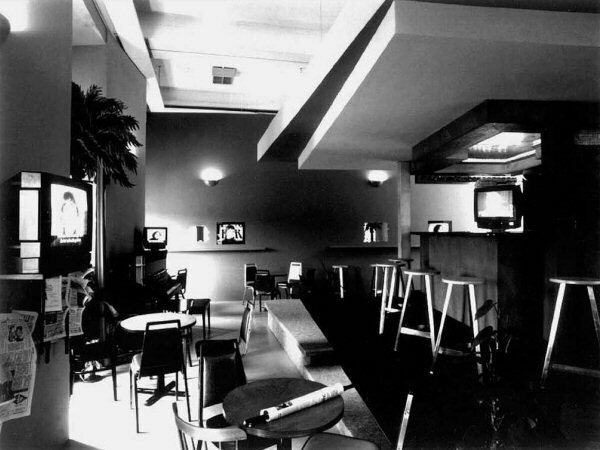 General installation view of "...from the Transit Bar" (1992), documenta IX, Kassel (Germany). Installation view (detail). National Gallery of Canada (2003), Ottawa (Ontario). Courtesy of the NGC and the artist. Photo: Charles Hupé. The author first met Frenkel when she spoke at a DOCAM summit in 2006. Upon hearing her speak candidly about the documentation and conservation of her works, she knew that she wanted to collaborate with her. Given the attention that archives are currently garnering in the contemporary art world, Sylvie Lacerte did not want to create a mere tribute to a passing trend, nor did she wish to echo the work or vision of the invaluable Frenkel fonds archivist. Her intent was instead to shed light on the documentation behind Frenkel's creative practice. 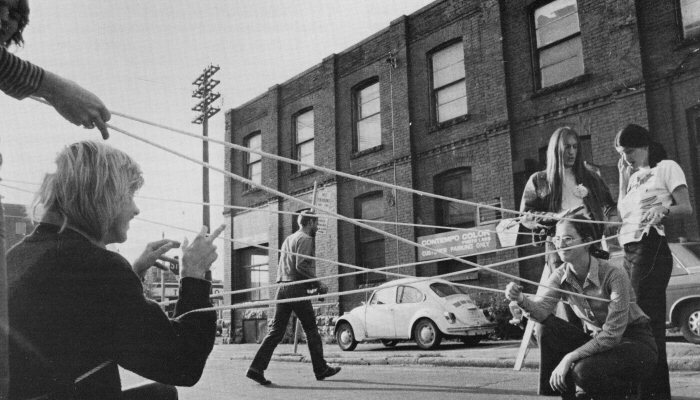 The exhibition is based on the archival documents of three of Frenkel's works: String Games: Improvisations for Inter-City Video (Montreal-Toronto, 1974), "...from the Transit Bar" (1992), and ONCE NEAR WATER: Notes from the Scaffolding Archive (2008–2009). Frenkel and Lacerte designed a conceptual structure for the exhibition based on four themes: archives as a creative strategy; work cycles; the in situ aspect of the works and their iterations; and the use and evolution of technology. The explorations conducted up till now represent only the tip of the iceberg, for Frenkel's multifaceted production dates back more than 40 years. 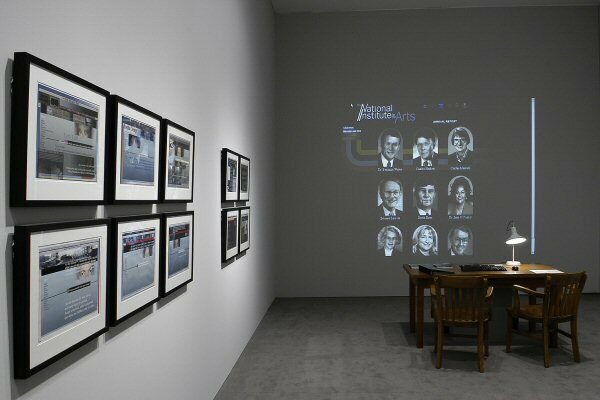 However, the author hopes that this archival overview will provide a sense of the artist's bold practice, artistic discipline, techniques, and technologies. 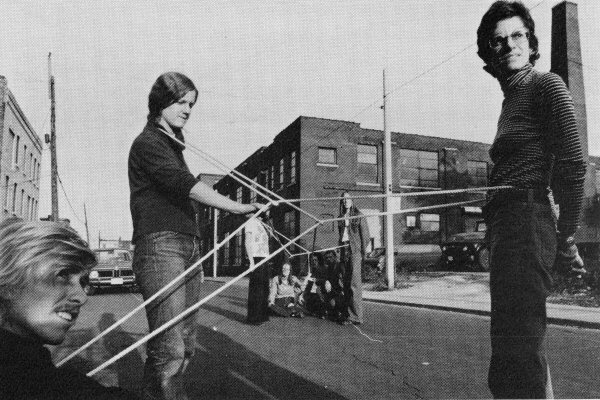 Il était crucial de bien circonscrire les paramètres de cette exposition fondée sur des documents d'archives s'articulant autour de trois œuvres majeures du corpus de Frenkel, soit String Games: Improvisations for Inter-City Video (Montreal- Toronto, 1974), "...from the Transit Bar"/"...du transitbar" (1992) et ONCE NEAR WATER: Notes from the Scaffolding Archive (2008–2009). Frenkel et moi avons imaginé une structure conceptuelle contenant quatre axes principaux qui nous permettraient de maintenir une ligne directrice cohérente tout au long du processus, afin que la cartographie (6) de son parcours artistique prenne tout son sens. L'art et le politique traversent l'œuvre de Frenkel avec gravité, mais parfois aussi avec irrévérence, voire avec espièglerie (l'artiste dirait mischievousness). Chez elle, le politique tisse la trame narrative (le storytelling), tel un palimpseste de vérités cachées qui ne sont révélées qu'après une enquête exhaustive, où suspense, indices et pièces à conviction (evidence) éclairent des éléments comme la mémoire (personnelle et collective), l'oubli, la perte, l'abus de pouvoir et les migrations — tous reliés par un fil nouant l'étoffe de ses œuvres. Interview with Vera Frenkel / interviewer, camera: Caroline Langill (37 min. 29 sec.). Interview conducted August 17, 2006 in Toronto, Ontario.